All media art competition is annual art competition sponsored by 'The Artist's Magazine'. Winners get cash rewards and also get their works featured during the July- August 2017 magazine issue. You can enter the competition and manage your entries here: www.artistsnetwork.com/... All entries should be submitted online as digital files and there is no limit to your entries. Artists can participate from all over the world. Image requirements for entries: JPG files (Please try to keep the file size under 5 MB to ensure proper uploading). ll entrants should be prepared to be able to send a hi-resolution print-quality replacement file should their entry be among those selected as a winner. For publication in Watercolor Artist, these files should be 300 dpi when saved at approximately 8×10 inches (2400×3600 pixels), ideally, and 5×7 inches (1500×2100 pixels) at minimum. 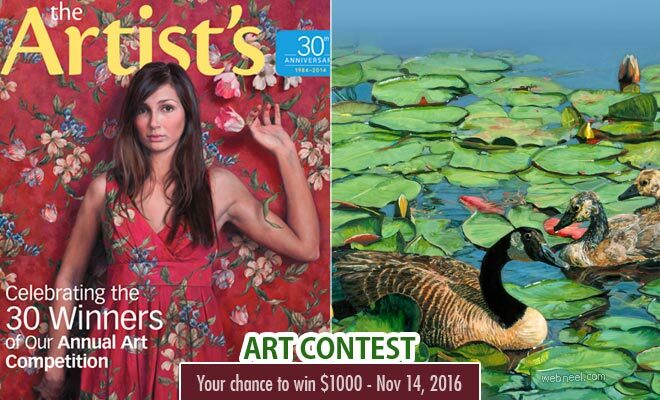 Winning work will be published in the July-August 2017 issue of The Artist’s Magazine. Winner will receive complimentary subscriptions to The Artist’s Magazine and $100 towards the purchase of North Light Books. Winning work will be featured on the The Artist’s Magazine. Winners will receive complimentary subscriptions to The Artist’s Magazine and $100 towards the purchase of North Light Books. Winning work will be featured on the The Artist’s Magazine. HONORABLE MENTIONS : Winners will receive complimentary subscriptions to The Artist’s Magazine and $50 towards the purchase of North Light Books. Winners names will be listed on the The Artist’s Magazine. Categories : Acrylic: paintings executed in watermedia, with acrylic being the dominant (80 percent at least) on any surface; additions of other media are permissible. Graphite, charcoal, ink & scratchboard: works that are executed primarily with drawing materials, including pen and ink, although additions of pastel, watercolor or other media are permissible. Mixed media and collage: any materials on any surface. Oil and oil pastel: paintings done in oil-based media on canvas, board, paper, or wood. Colored Pencil: works executed primarily (at least 80 percent) in colored pencil; underlying layers and additions in other media are permissible. Watercolor & Gouache: paintings executed primarily (at least 80 percent) in watercolor; additions of gouache, acrylic or other media are permissible. Digital: works include archival 2D prints or digitally-assisted work.